It’s simple, but makes so much sense. 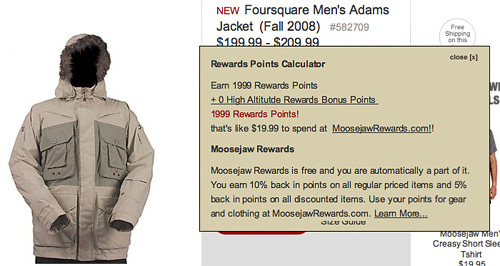 that’s like $19.99 to spend at MoosejawRewards.com!! You never know which page will be a customer landing page – you can’t rely on your home page to promote your loyalty program. When you open the pop-up to learn more, it has a compelling offer – 5-10% back on everything you buy. “You are automatically a part of it” makes it sound easy and effortless to be involved, although later you find out you do need an account. “Use your points for gear and clothing.” In this case, the reward items are the same kinds of products as the mother-store. They’re not branded keychains and coffee mugs. If a customer is comparison shopping, this may win the sale over a competitor, all else equal. To earn points, you must sign up for an account online or at the Moosejaw shops and start shopping. There is absolutely no charge!!! Points are tracked by email address so hopefully you’re not afraid to provide your email address to us. We’ll email you points updates and special offers and you can opt out of email at any time without losing any points.